LOMITA, California (CNN) -- He was one of the first U.S. soldiers killed in combat in Iraq, even though the United States wasn't quite his country. Lance Cpl. Jose Antonio Gutierrez, 22, an orphan who grew up on the streets of Guatemala City, made the perilous border crossing through Mexico and entered the U.S. illegally when he was 14, his family said. He was later granted legal resident status and went to high school and college in California before joining the Marines in March 2002. 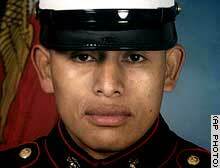 Only a year in the service, Gutierrez died March 21 in a firefight near the Iraqi port city of Umm Qasr. "He has been given many opportunities since coming here and he wanted to give back a little bit to his adopted country," said Nora Mosquera, Gutierrez's foster mother. The lanky youth dreamed of becoming an architect and bringing his sister, Engracia Sirin Gutierrez, from Guatemala. The sister visited Southern California in time to meet Gutierrez's flag-draped casket at the entrance of St. Margaret Mary Catholic Church April 7. Now she's hoping for permission to live in the United States. "I do feel proud, because not just anyone gives up their life for another country," she told reporters at a news conference recently. "But at the same time it makes me sad because he fought for something that wasn't his." Cardinal Roger Mahony told the standing-room-only crowd at Gutierrez's mass that they were honoring "a great man" and an American citizen. Gutierrez was awarded his U.S. citizenship posthumously. Bruce Harris, director of Casa Alianza, a shelter for Guatemalan street children, said Gutierrez was 8 when he went to live there. His parents both died by the time he was 4, Mosquera said. "He would inhale a toxic shoe glue at times to escape from the hunger and loneliness," Harris said. But yearning for a better life, the strong-willed youth left Guatemala, hopping trains and hitchhiking through Mexico until he reached the United States, Mosquera said. "Jose was an excellent example of a child who had many problems early on, but somehow, with his strong faith in God, he was able to overcome those obstacles to reach his goals," she said. Along with his love of soccer and chess, Gutierrez also enjoyed writing poetry, Mosquera said. "Letter to God," a poem he wrote in 2000, was read at his funeral. "Thank you for permitting me to live another year, thank you for what I have, for the type of person I am, for my dreams that don't die," he wrote in Spanish. "May the firearms be silent and the teachings of love flourish."